An innovative Sutherland-based program that helps women and children who have experienced domestic and family violence has received a major funding boost with the PAYCE Foundation pledging $300,000 over three years. The funding from the PAYCE Foundation – which is the philanthropic arm of property developer and investment company PAYCE – will not only fund staff but also research into the effectiveness of the program. Building Resilience in Children (BRIC) is a child-focused early intervention program that works with the primary caregiver and child post separation from the perpetrator, to reduce the impacts of childhood trauma that is the result of exposure to domestic violence. Sutherland Shire Family Services CEO Diane Manns said on-going funding support was vital to meet the demand for the service which helps many families impacted by trauma every year. “Research indicates that in abusive relationships, children and women continue to be exposed to domestic violence after parental separation, creating a perpetual cycle of trauma,’’ she said. The program started in 2011. Sutherland Shire Family Services has now commenced working with the University of NSW to undertake a three-year evaluation. PAYCE Foundation Director Dominic Sullivan said the program was making a real difference to children suffering from exposure to domestic violence. “Every child deserves to grow up in a violence-free, nurturing environment which will allow them to reach their full potential,” he said. Mr Sullivan said the PAYCE Foundation believes that the work Sutherland Shire Family Services was doing made a big difference in the community. “We want to see this program reach its full potential because children are the future of our community,” he said. 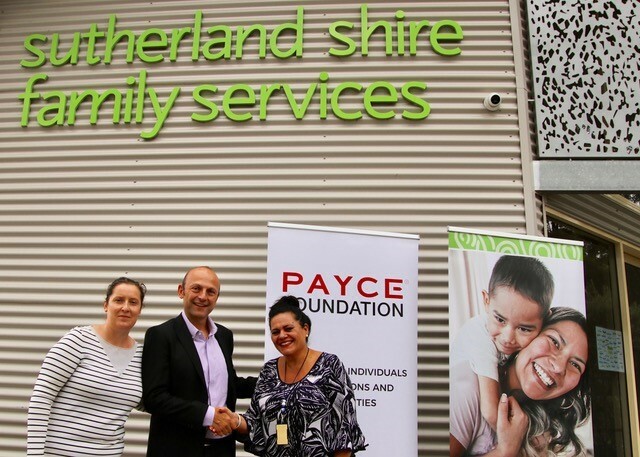 The PAYCE Foundation has been supporting programs run by Sutherland Shire Family Services for a number of years, including a domestic violence education program for construction sites known as Toolbox Talks as well as providing support for their innovative Pull Ya Head In Domestic Violence film campaign. The program, launched in 2017, educates men in the construction industry on the impacts of domestic violence and equips them with tools to challenge inappropriate behaviour they may encounter in their own lives. For more information visit ssfs.org.au, contact Sutherland Shire Family Service on 9528 2933 or PAYCE Foundation on 80802300.